I was happy with Blake’s expertise and help with fitting the car to my needs. The operation was seamless. Their man Bradlee handled the finances so quickly and I appreciated that. 1st time patron I was treated like a King. I went to check out a used BMW sedan. I was helped by Alex Goergen. He did a great job showing me all the features of the vehicle and I had a great test drive. I like it when salesman isn't pushy. I ended up not buying that particular vehicle but will be back to purchase an SUV from him soon. Bradley Franklin went above and beyond to create an excellent experience and to ensure that we got the vehicle we preferred in a timely manner. He guided is through the obstacles and provided detailed information regarding our options. We wouldn't made it through it without Mr. Franklin. We recommend Mr. Bradley Franklin to all looking to purchase a vehicle. Thank you, sir! Truly a painless and smooth transition to our new X5! Blake was truly a pleasure to work with and shows a passion for not just sales, but customer satisfaction as well. 10/10 would recommend. Great customer service from Neal Parod. He recognized our desire to get into a used Mini Cooper, and did everything he could to make it happen for us. 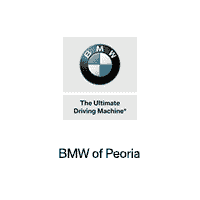 Love the vehicle and very much appreciate the team at BMW Peoria. From start to finish, it was an effortless experience. I was coordinating the out of state purchase of my BMW CPO with John Rumley. John was extremely responsive to my needs, contacting me via phone, text, and email as required well beyond business hours to make sure everything was in order for when I flew in to take delivery of my vehicle. I was also offer the option to have the car delivered for a very reasonable price. At the dealership, the paperwork all went smoothly. The entire management team and owners introduced themselves to me and spent time to get to know me as well. Overall a great experience.